I swore that with baby number 2 I would stay on top of things... be ahead of the game! Be totally prepared for his arrival. HA! I should have known better, right? Between maintaining our home, being a Mom (which includes taking Halle to different activities, outings, preschool, etc) and maintaining our social life, let's just say I'm a little further behind than I planned to be at almost 33 weeks pregnant! 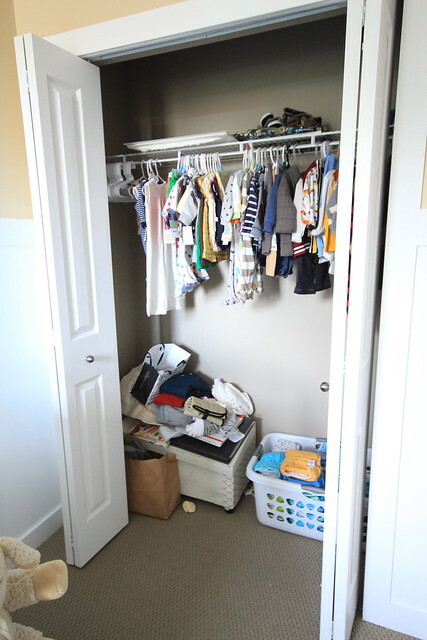 My due date with this little guy is sneaking up on us quite quickly and I am anxious to have his room mostly (if not completely) finished by the time that he arrives! B has been an absolute trooper, helping me make this whole thing come together. Without him, absolutely nothing would be done! There is still a lot to do, but between the two of us, I know that we'll get there (eventually). 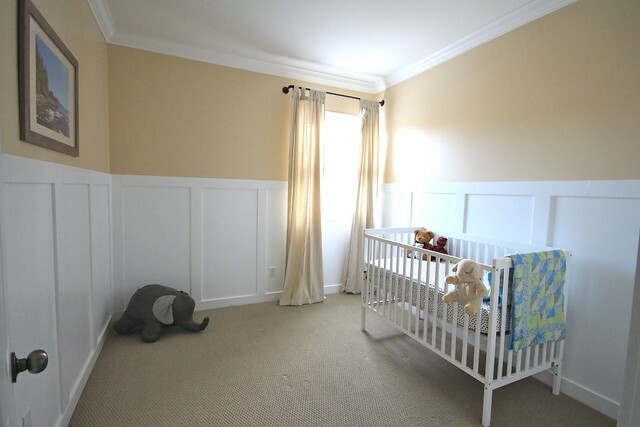 Unlike Halle's nursery in our first home, the space that is the nursery lacked any sort of character. It was just a bland grey box, that we were using as a "guest room" (we dumped a queen size bed in there and pretty much called it a day). Here's how the room looked the day we did our final walk through (in April of 2013). 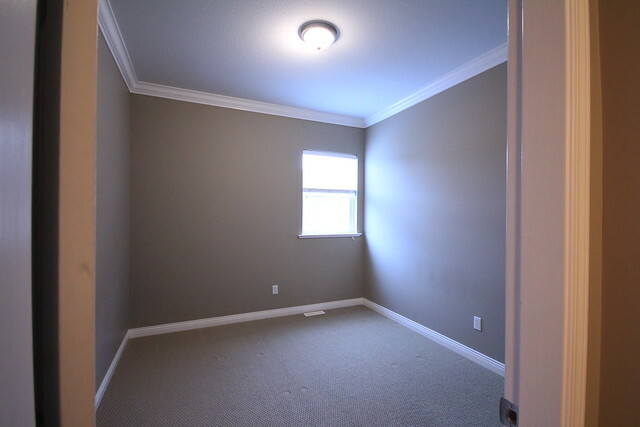 I never got a picture of the opposite side of the room on that day, but the closet also had no trim around it, much like that little window shoved into the corner. 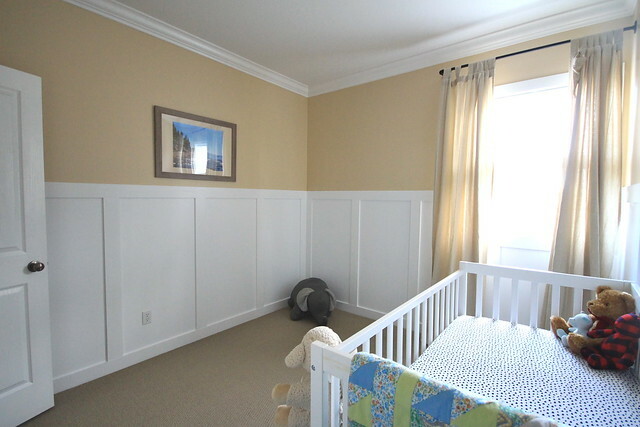 I knew that I wanted this space to feel more cozy and have more character, so we started to discuss adding trim to the walls. We had a few ideas of what we might do, then I saw this post from Bethany over at This Little Estate and thought that her idea sounded perfect! As soon as B saw what they did he was right on board as well. For those of you who follow me on Instagram, you may have seen this photo of B getting to work a few weeks ago. I wish I had documented his process a lot better, but that photo is about as good as it gets. He essentially did the same thing as Bethany and her husband did. 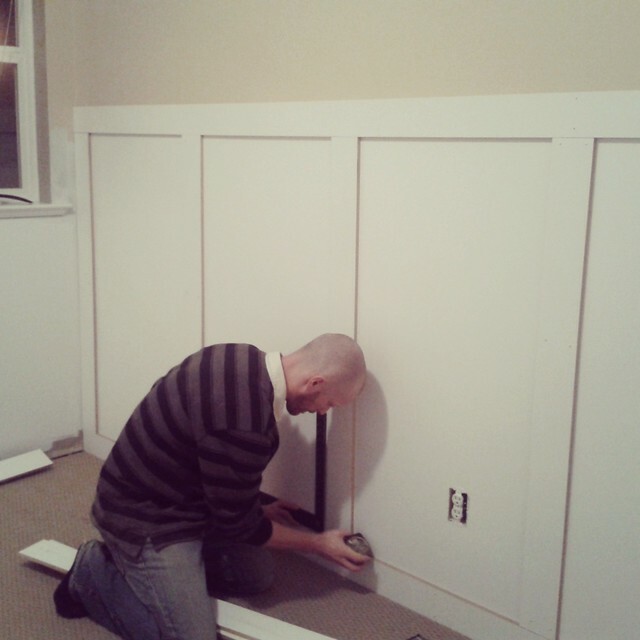 He ripped some MDF boards into strips, and used his nail gun to attach them to the wall. 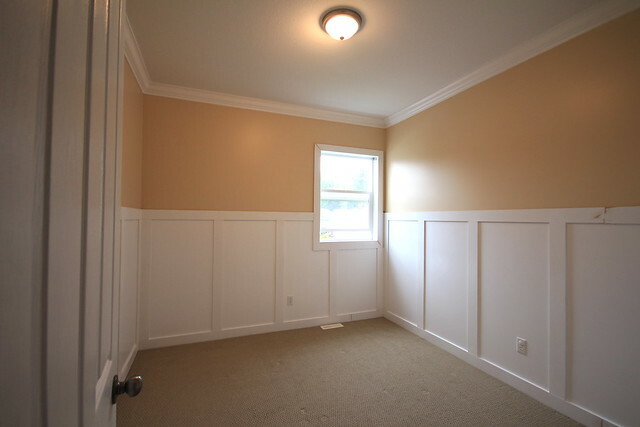 He also trimmed out the window and closet doors (as well as the bedroom door of course, to ensure it matched with the rest of the room). 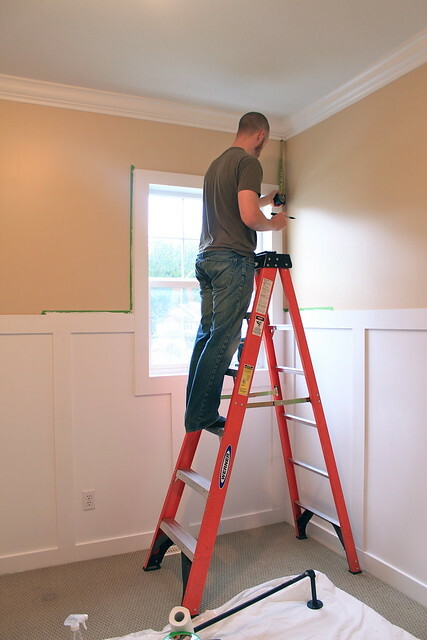 Then he had to fill in the nail holes, and caulk around some of the edges, sand it all down and give it too good coats of white trim paint. By the end of that evening I wanted to have the curtains up. We had purchased some pipe from Home Depot and spray painted it black. 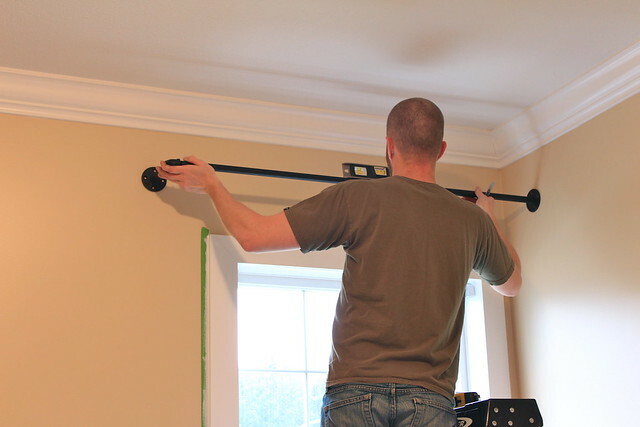 Once it was dry, B attached it to the wall using large butterfly clips that fit in behind the drywall. We secured one side to the wall that the window is on, and the other straight to the opposite wall. So there you have it! Not long now till our little man joins us, and progress is slow going in his room... but we are getting there! I can't wait to share the finished space! Hopefully I will be able to well before his arrival.